IRL news about Hacksaw Ridge, Pokemon Sun, and new jobs that smell like overbearing fruits and flowers. Industry news covers topics like the difficulty in addressing homosexuality in anime, and who is earning the top dollar working with anime. Reviews this week are of Pan de Peace and JoJo, one is about a group of girls who like bread a little too much and the other is about muscle bound men fighting each other with their personas. I’ll let you guess which one is which. 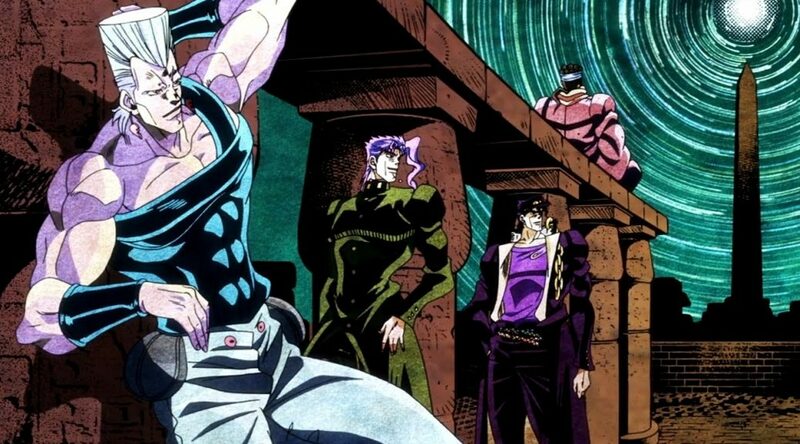 JoJo's Bizarre Adventure: Stardust Crusaders - Egyptian ArcPan de Peace! What I like most about the update to the AP site is the image banners, because I get to stare at a frickin’ sweet JoJo’s picture! I will admit, they do spruce things up a bit. Red, it’s called JoJo’s Bizarre adventure, not JoJo’s Karate Adventure. If you’re not into that (like Ryo, who I am making a disappointing face at right now) then step off! Let’s get one more thing straight: Persona are Stand rip-offs, not the other way around. Respect your damn elders. Phew! Got that off my chest. Now let’s talk intolerance. First, i’d just love to say how much I giggle when white people argue over minorites and oppressed folk- while the people in question are not included in the conversation at all. “Protect”? Try “Stand together with” You know, like equals. The joke of the day I will give equally to the both of you. So you think people who are intolerant of gay relationships are going to watch a figure skating anime? BWAHAHAHAHA! Good one. That’s rich.